Are you sure its as much as 8"!! That's a lot of space in a narrow boat! It would make your walkways and doors extremely narrow. Perhaps you can reduce the width of the furniture, do look into the shorter depth washing machines they are only 40cm deep instead of around 60cm, this would help I guess. My guess is 4" each side is about right. 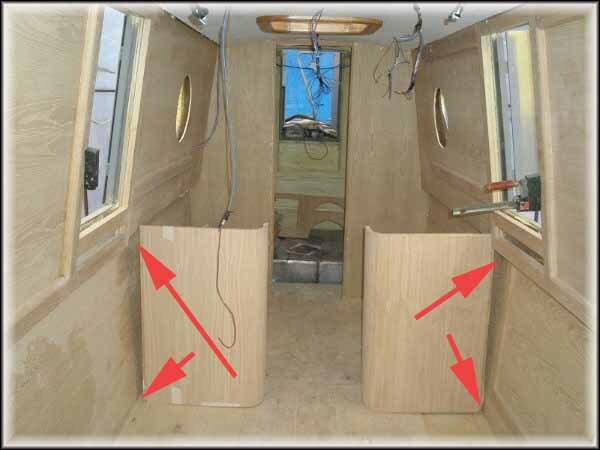 In the above photo you can see the vertical edge on the end cupboard extends from the inside of the gunwale to the corner of the floor. My guess is the gunwale is about 4" wide.